Feminism and transgender, as social factions or collective subjectivities, have historically evaded, vilified or negated each other’s philosophy and subjectivities. In particular, separatist feminist theorists have portrayed the two ‘sides’ as consisting of mutually incompatible aims and subjectivities. These portrayals have worked to the detriment of both feminism and transgender. Third Wave Feminism and Transgender considers what positive outcomes on society in general, and the law as it pertains to gender in particular, may emerge from the identification of and cooperation between third wave feminism and transgender. 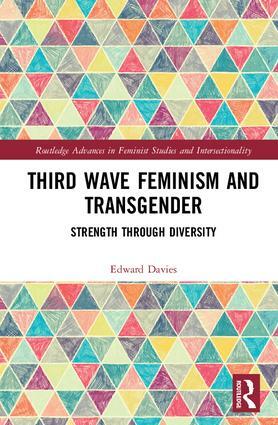 Challenging the ‘internecine exclusion’ between and within each faction, Davies shows that queer-inspired philosophical third wave feminism promises to be an inclusive social discourse providing a substantial challenge to mutual exclusion. Indeed, this book explores the span of maternal relations, including womanism, ethics of care and semiotic language and subsequently reveals how gender variant people can highlight the gendered operation of conventional ethics. With a focus on Carol Gilligan and Julia Kristeva as key instigators of a philosophical third wave of feminism, this enlightening monograph will appeal to students and postdoctoral researchers interested in fields such as women’s studies, transgender studies and gender law. Edward Burlton Davies has undertaken research at Lancaster and Manchester Metropolitan Universities. His research interests focus on third wave feminism, womanism, gender variance and reconstruction of gender law.